For a discussion on the rarity of enameled glass from the Palace workshops, and the problems of controlling the enamels, see lot 617. The pale sepia palette used on this bottle is extremely rare, and is only relieved by the pink and blue enamel highlights used to the paint the clothing, and pale green for foliage. Under the Yongzheng Emperor, some porcelain enameled at the Palace workshops was decorated in a single color (ruby-red, blue, black). This in turn influenced production at Jingde Zhen. The Jiangxi tongzhi (General Description of the Province of Jiangxi), published in 1732, mentions the making of porcelain decorated only in black. When using just black, or sepia, the palette allowed the painter to closely follow the style of traditional Chinese landscape painting, which is reflected in the rendering of the mountainous background on this bottle. An enameled glass bottle painted in sepia, but with a more traditional Chinese subject of geese and with a calligraphic inscription on the reverse (also from the Qianlong Palace workshops) is illustrated by Moss, Graham, Tsang, The Art of the Chinese Snuff Bottle. The J & J Collection, no. 195. 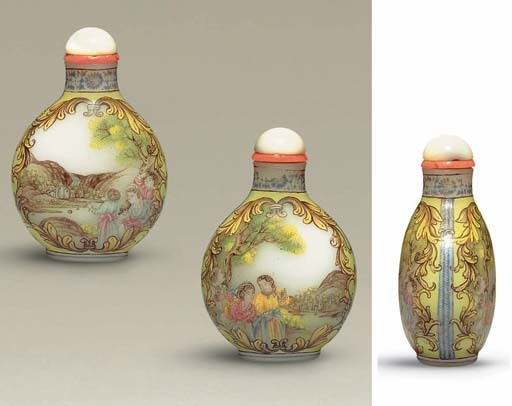 An enameled porcelain bottle with sepia-toned landscape painting, dated to the Qianlong period, is illustrated in Zhongguo Biyanhu Zhenshang, p. 129, no. 138. Neither the Kangxi nor the Yongzheng Emperors cared for foreign subject matter, despite having European missionaries employed at the Palace workshops. The Qianlong Emperor, however was intrigued by Western subjects and embraced them wholeheartedly from the beginning of his reign, enjoying both foreign scenes and a range of distinctly Western border designs. Although the rope band here is typical of Palace workshop designs derived from a Chinese source, the floral surrounds are typically European with the acanthus leaves transformed into a rococo design derived from France. Dating from early in the reign, when the most artistic of Palace enameling on glass was produced, the combination of subject matter and palette make this bottle unique. Nothing else quite like it is recorded. The pale colors of the palette give a first impression of faded enamels, but in fact they are in remarkably good condition and not faded at all, the only problems rising from misfiring of some of the blue enamel (a frequent problem early in the reign) affecting the reign mark and some of the upper neck.